Got flatulence*? Soak your beans and grains! Got osteoporosis*? Soak your beans and grains! Got Irritable Bowel Syndrome or digestive disorders? Soak your beans and grains! Current USDA dietary guidelines suggest we eat lots of whole grains and beans. 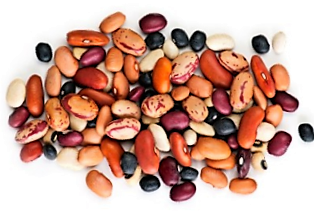 It is true that beans, legumes, and grains are chock full of vitamins and protein your body needs. However, they haven’t told you that they must be prepared in traditional ways so that you can actually digest them! Love beans but hate the gas? All of us have experienced the gastric distress of improperly prepared beans. Tummy ache, cramping, bloating and gas! Leave those canned beans behind for the nutrition of beans prepared in your own kitchen. Whole grains are the hardest food for the human body to digest, and all grains contain anti-nutrients that must be neutralized before cooking. Phytic acid can block the absorption of calcium, magnesium, copper and zinc. Enzyme inhibitors can block enzymes. Gluten must be pre-digested, and traditional soaking techniques accomplish this with ease. The techniques explained on this chart translate into less strain on the digestive system, better digestive health and more nutrients available to your body. Learn how to prepare whole grains so that the minerals and enzymes are not lost! Everything you need to know about soaking beans and whole grains in one beautifully hand-lettered and illustrated 12” x 18” laminated chart. Perfect for your refrigerator … truly functional kitchen art. This chart explains all the whys and all the hows of traditional soaking methods so that you can prepare any bean or grain so it is delicious and digestible. You'll taste the difference, and your body will thank you for it. * Flatulence is not normal. It means your digestive system is having a hard time breaking down your food. * Failure to soak whole grains may also lead to bone loss. The information contained in this chart is not intended to be a substitute for professional medical advice, diagnosis or treatment. It is provided for educational purposes only. You assume full responsibility for how you choose to use this information. Please note, the consumption of all foods, whether raw or cooked, pasteurized or unpasteurized, inherently carries some degree of risk.